This is the great Egyptian god, Khnum. Though he doesn't have the same glam street-cred as some of his colleagues - Ra, Osiris, Amon and Isis, for instance - he was, nonetheless, a very important deity to the ancient Egyptians. It was the ram-headed god, Khnum, who fashioned the mortal bodies of all ancient Egyptians from clay, on his potter's wheel. Khnum wears one of the most flamboyant headdresses of all the Egyptian gods, the plumed Atef crown comprising of gilt horns, solar disc and ostrich plumes. 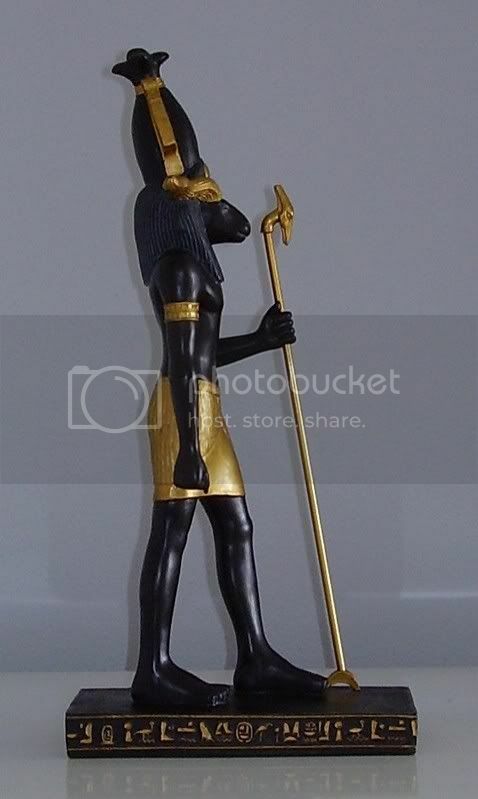 He carries in his left hand a gilt sceptre symbolising strength and power. 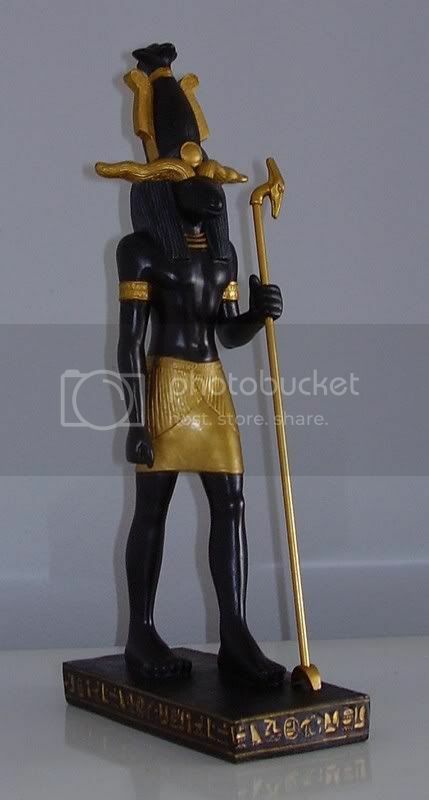 I bought this figurine some years ago at an Egyptian bazaar here in Sydney. It is 40cm (16 inches) tall. They ALWAYS have hot bodies! I never paid too much attention to the female ones, but I would imagine they probably look pretty good too, to a straight man or a gay woman. I love all your statues Kerry! I'm seriously thinking about starting my own collection of the various gods and goddesses. Those statues are beautiful. Apollo was passionately in love with a youth named Hyacinthus. He accompanied him in his sports, carried the nets when he went fishing, led the dogs when he went to hunt, followed him in his excursions in the mountains, and neglected for him his lyre and his arrows. One day they played a game of quoits together, and Apollo, heaving aloft the discus, with strength mingled with skill, sent it high and far. Hyacinthus watched it as it flew, and excited with the sport ran forward to seize it, eager to make his throw, when the quoit bounded from the earth and struck him in the forehead. He fainted and fell. The god, as pale as himself, raised him and tried all his art to staunch the wound and retain the flitting life, but all in vain; the hurt was past the power of medicine. As when one has broken the stem of a lily in the garden it hangs its head and turns its flowers to the earth, so the head of the dying Hyacinthus, as if too heavy for his neck, fell over on his shoulder. "Thou diest, Hyacinthus," so spoke Apollo, "robbed of thy youth by me. Thine is the suffering, mine the crime. Would that I could die for thee! But since that may not be, thou shalt live with me in memory and in song. My lyre shall celebrate thee, my song shall tell thy fate, and thou shalt become a flower inscribed with my regrets." While Apollo spoke, behold the blood which had flowed on the ground and stained the earth ceased to be blood; but a flower of hue more beautiful than the Tyrian sprang up, resembling the lily, if it were not that this is purple and that silvery white. And this was not enough for Apollo; but to confer still greater honour, he marked the petals with his sorrow, and inscribed "Ah! ah!" upon them, as we see to this day. The flower bears the name of Hyacinthus, and with every returning spring revives the memory of his fate. 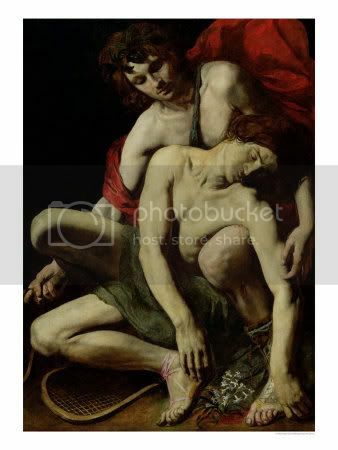 In another account, it was said that Zephyrus (the god of the west wind), who was also in love with Hyacinthus and jealous of his preference of Apollo, blew the quoit out of its course to make it strike Hyacinthus. Here are a bunch of pics of the items I have in my Brokie collection. Some of it is personal stuff, not licensed in any way, but it's all Brokeback related. BetterMost bean can given to me at the first BBQ in Texas. 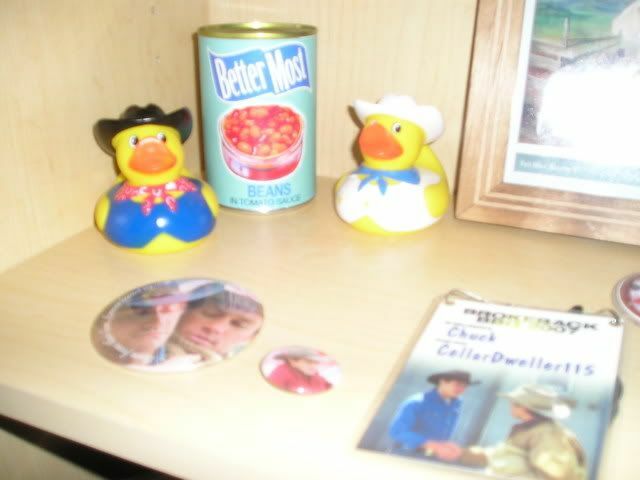 A "Jack & Ennis" rubber duckie given to be by a Brokie, some pins from other gatherings, the nametag I got in Colorado. 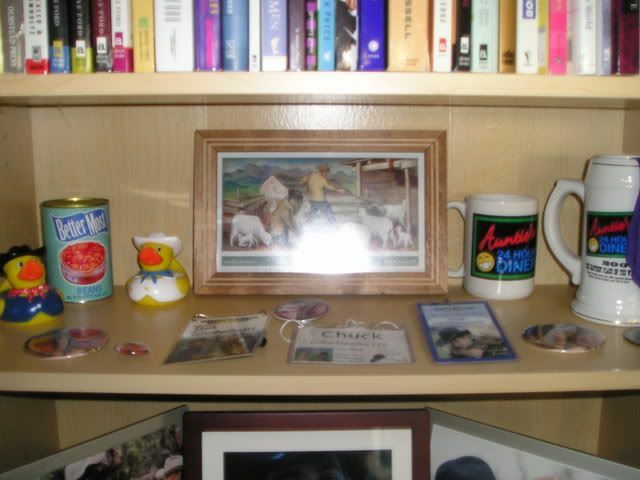 A pic of the mural on the Riverton, Wy post office, a "Joker/Ennis" pin, name badges from gatherings in Co., Ca., and Oxford UK., and an "Auntie's 24 Hour Diner" mug. 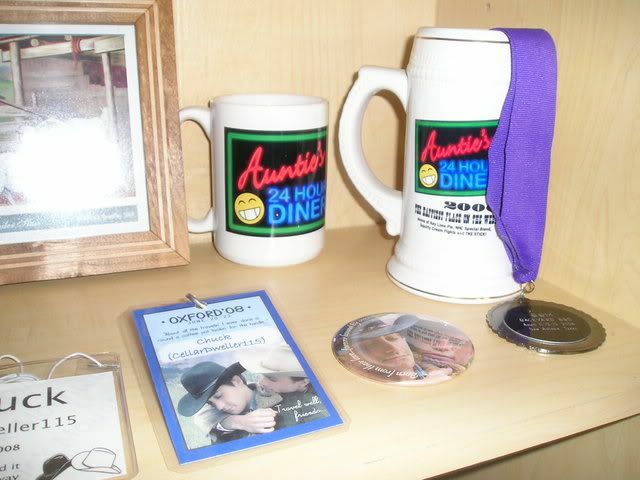 Oxford UK name badge, dozy embrace pin, Auntie's 24 Hour Diner mug and stein, and a medal from the first BBQ in Texas. In the back, 3 pics from the movie. Jack & Ennis by the fire, Jack watching Ennis ride off from the Dozy Embrace (given to me by a Brokie), and the Dozy Embrace. 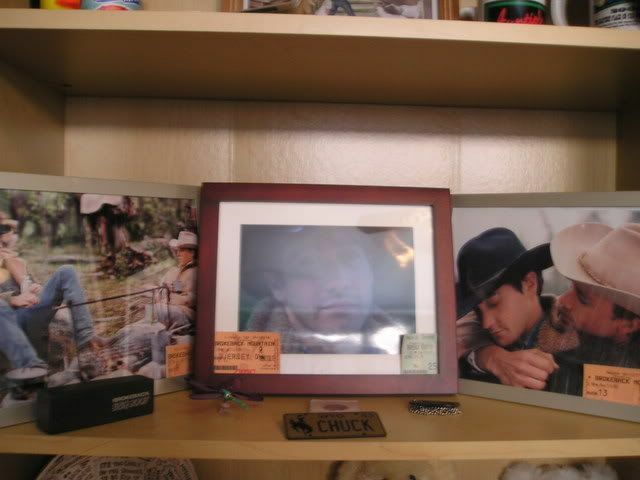 Each frame has ticket stubs from times I saw Brokeback. 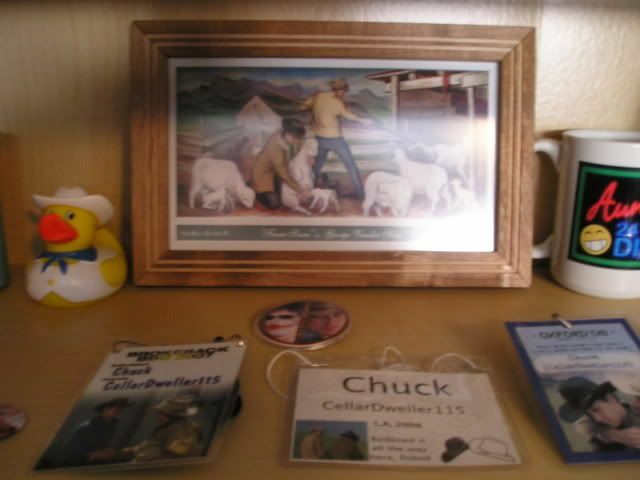 In front of the pics, from the right, my harmonica from Colorado. 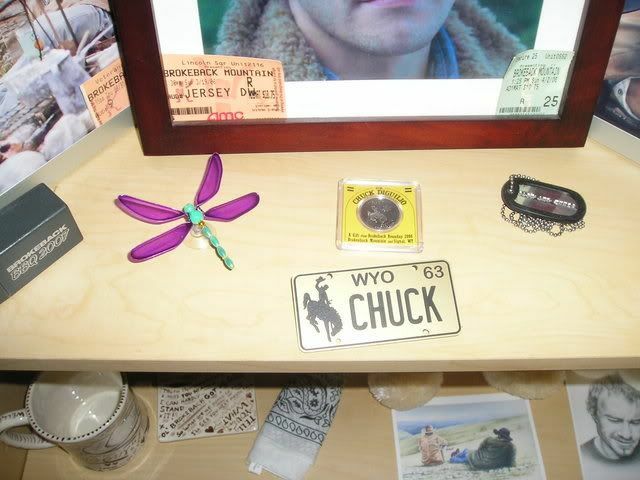 A dragonfly given to me in honor of Heath and Jackie in Wyoming, my Wyoming name badge and quarter, and an Ennis & Jack dog tag. 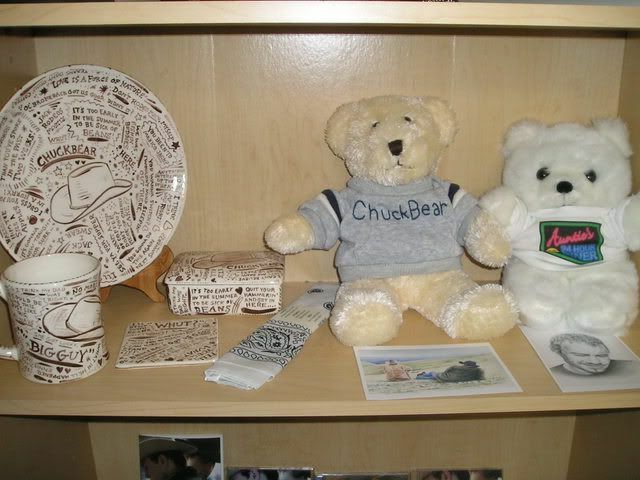 Pieces of handmade pottery given to me by a Brokie (made by gnash), a bandana from the Texas BBQ, some teddy bears from a Brokie, and two drawnings given out at the Oxford gathering (made by Janie G).